Successfully Added vRobot - Mini Robot Vacuum Cleaner to your Shopping Cart. The latest intelligent mini vRobot vacuum cleaner! Simply power on the vRobot mini vacuum cleaner and it will maneuver all over your home vacuuming, while you sit back and relax. This special robot vacuum cleaner comes with 3 setting anti-cliff sensors modes for different reflective surfaces, unlike its predecessors, this unique feature allows you to set the sensors according to your floor color, the darker the floor color, the higher the anti-cliff sensor setting should be set. The vRobot mini vacuum cleaner effectively picks up dirt, debris, pet hair and dust from carpets, wooden floors, marble floors and nylon flooring, this is possible thanks to the robot vacuum cleaner counter rotating bristle brush and powerful suction ability. The vRobot smart design means this mini robot vacuum cleaner will not get stuck in corners or fall down the stairs. When faced with obstacles or a surface edge it will simply turn around and continue its primary directive, which is to clean. The sensors on-board the robot vacuum cleaner will also detect cliffs such as stairwells and knows to turn around. The vRobot Mini Robot Vacuum Cleaner also comes with a universal (110-220V) power adapter, unlike other robot vacuum cleaners. This brilliant new innovation in home and lifestyle gadgetry is in stock in our warehouse right now! 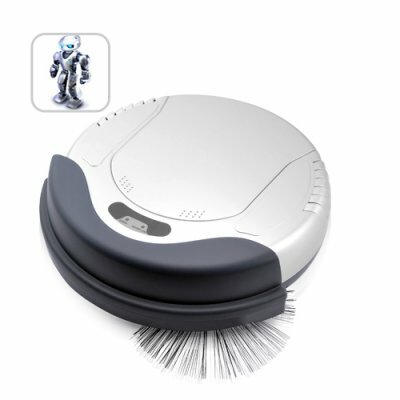 The vRobot vacuum cleaner is available to you at a factory direct wholesale price. Order yours today, and next week your new mini robot vacuum cleaner can be cleaning your home while you are out having fun with friends. Yes it is! Just like painting, preparation is the key to using this product properly. So how do I prepare my vacuum cleaner? Will the robot carpet cleaner work on all home flooring types? Yes. Long threaded, heavy shag carpet will be difficult for the CVJE-G101 since it is only raised 22mm from the ground. Does the vRobot mini vacuum cleaner come with an IR Wall and an auto docking station for recharging? No, the vRobot does not come with an IR wall and docking station.